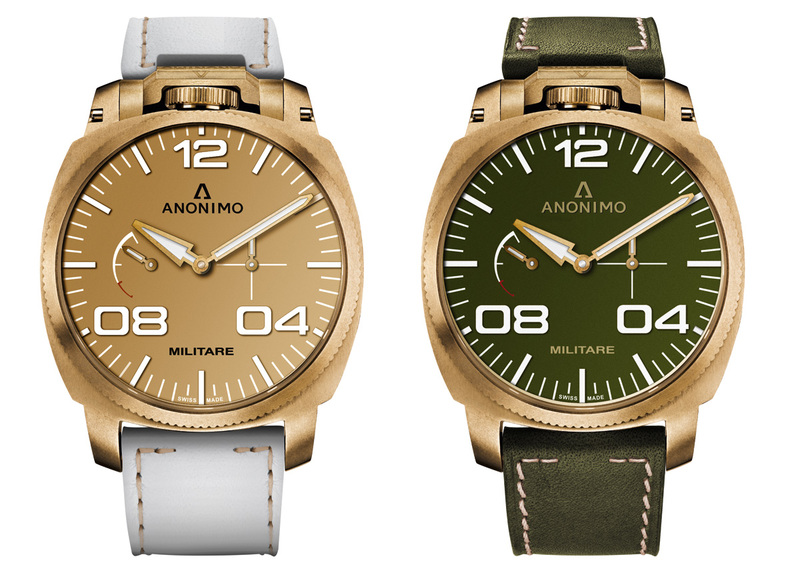 Florentine brand Anonimo has just unveiled its new line of bronze case watches, the Militare Alpini. Comprising a chronograph and a power reserve model, the Militare Alpini is also available with an unusual bronze dial. 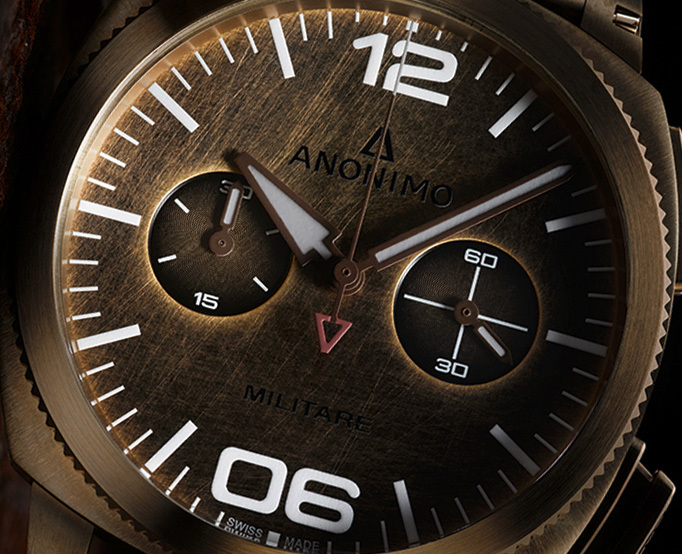 Baselworld 2014 will see the revived Anonimo present its new line of timepieces, all of which are equipped with the brand’s trademark crown at 12 o’clock. 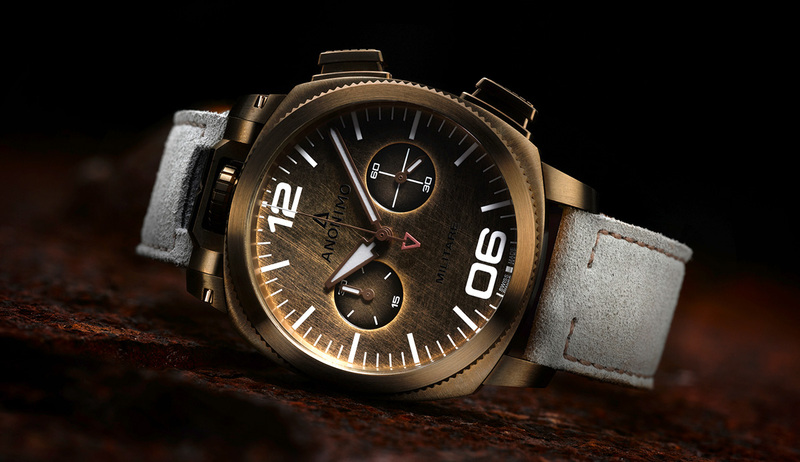 Inspired by the alpine regiments of the Italian armed forces, the flagship Militare Alpini collection features bronze cases, including two versions with unusual aged bronze dials. Originally founded in Florence in the former premises of Panerai when the latter moved to Switzerland, Anonimo was recently resurrected – in Switzerland. However, the brand’s signature bronze watch cases are still made near Florence by a specialist metalworking firm. Available with either a military green dial, or an aged bronze dial with a striking, tumble polished finish, the Militare Alpini watches are paired with white straps for the bronze dials, and green straps for the olive dials, colours inspired by the uniforms of Italy’s alpine troops. The bronze dial is unusual and striking. Made from a thin disc of bronze, the dial has an uneven, almost raw finish, with a slight patina. The bronze cases are 43 mm case in diameter with a steel case back. Typically found in maritime equipment like ship propellers, the bronze alloy used has a particularly high resistance to corrosion. The Military Alpini Power Reserve Indicator is equipped with the Peseux 7001, featuring a sub-seconds at three o’clock and the power reserve at nine. And the chronograph uses the Sellita SW300, a clone of the ETA 2892, with a Dubois-Depraz 2035T chronograph module. This modular construction allows for the novel combination of the chronograph pushers on the of the case, while the crown remains at 12 o’clock. The Military Alpini Chronographs will retail for €8500 (~US$11,700), while the Power Reserve will be €7200 (~US$9940).